Jimmy Jangles presents: The Optimus Prime Experiment: What do Autobots eat? So like @coupdemain asked the question: "if autobots actuaaaallyyyyy ate food, what would they eat? 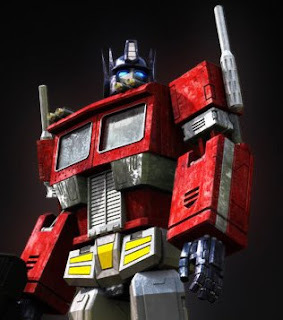 go ask Optimus Prime pleeeeeeease :)"
If you thought Autobots ate energon, you'd be wrong. I did go and ask Optimus Prime and he told me that Autobots eat all kinds of things. Grimlock in particular likes to eat petro rabbits while Jazz likes to eat Ella Fitzgerald records. Prime himself enjoys the odd pie and coke. Optimus also told me on the QT that Megatron eats kittens, Starscream puppies and Soundwave eats puppies with kitten sauce.